Curatio International Foundation Implements Results4TB research project under the Health Systems Research Initiative scheme in partnership with several leading research institutions: Queen Margaret University (Edinburgh), Institute of Tropical Medicine (Antwerp) and The London School of Hygiene & Tropical Medicine. Curatio International Foundation (CIF) is a not-for-profit, non-governmental organization with a mission to improve health through better functioning health systems. CIF’s work is underpinned by three core values: Hearing Needs, Building on Local Strength; and Delivering Innovative Context-specific Solutions. CIF’s work is based on a network of national and international professionals and researchers to bridge the gap between what is known about the problems at hand and what has to be done in order to solve them. CIF’s work intends to improve the functionality of health care systems and adequacy of health policies. For more information, please visit www.curatiofoundation.org. The Queen Margaret University Institute for Global Health and Development (IGHD) is a multi-disciplinary center for research and postgraduate education that addresses contemporary health and development challenges in low- and middle-income countries and their connection to global systems and trends. For more information, please visit www.qmu.ac.uk. It is ITM’s vision that each world citizen should be able to enjoy a healthy life, and that scientific progress is a motor of societal development. ITM aims at the advancement and spread of the sciences that contribute to tropical medicine and to public health in developing countries, inclusive of their global dimensions. ITM conducts, within a coherent academic triad, fundamental, translational and applied scientific research. It delivers advanced education and training and provides medical, scientific and societal expert services. Through an interdisciplinary approach and a focus on our niche in tropical medicine and international health, we strive for both scientific excellence and societal relevance. For more information, please visit www.itg.be. 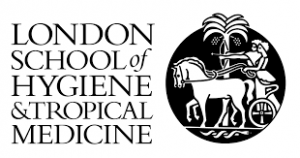 The London School of Hygiene & Tropical Medicine (LSHTM) is renowned for its research, postgraduate studies and continuing education in public and global health. The School has an international presence and collaborative ethos and is uniquely placed to help shape health policy and translate research findings into tangible impact. LSHTM’s mission is to improve health and health equity in the UK and worldwide; working in partnership to achieve excellence in public and global health research, education and translation of knowledge into policy and practice. For more information, please visit www.lshtm.ac.uk.